Dragon (aka a young boy) is eating his oatmeal when he spies a possible pirate on the beach (aka another boy in the sand box). Of course, Captain is not a pirate. He’s a ship captain who’s been separated from his ship. 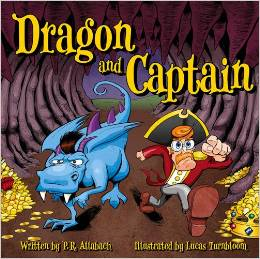 Dragon and Captain set out to find Captain’s ship and re-capture it from the real pirates. First, they need things from Dragon’s cave (er, bedroom). They trek through the dark forest (bushes) and stop at a waterfall (sprinkler). They spot the ship and defeat the pirates. Then it’s snack time. All the while, the grownups lurk in the background abut never interfere. The interaction between imagination and reality is brilliant. It will show kids that anything is possible. The illustrations are vivid and colorful clearly show how each boy resembles his alter ego. First graders will be able to tell the story from the pictures while still working on their literacy skills through the sparse text. The way the boys immediately get caught up in each other’s fantasies shows how easy friendship can be.